Before you start any journey, you have to know where you are going. Follow the guide below to set up your profile on Learning Curve’s Powered by WineEd learning portal. If you have any problems accessing the training contact your tutor. They will be happy to help. Your learning journey starts with an email inviting you to join our online learning portal. Click on the link to join us and start learning. 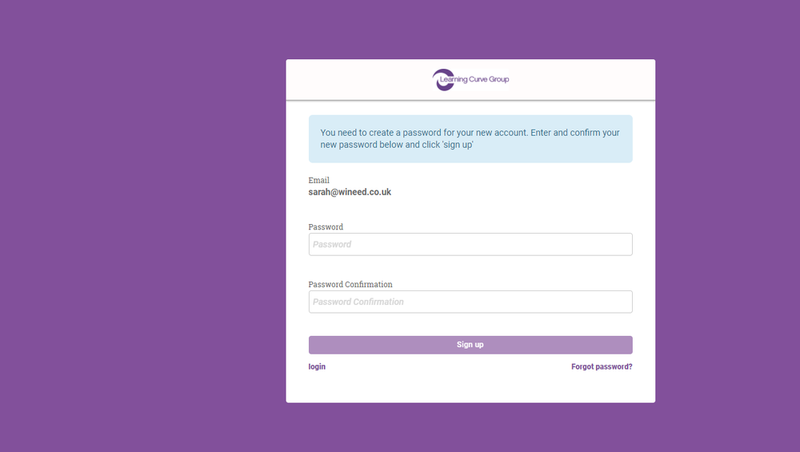 The first step is setting the password for your own Learning Curve profile. Meet your Learning Curve dashboard. The dashboard is your training hub. It shows the different courses you are taking and tracks your progress through them. Descriptions of the courses you are taking appear in the middle of your dashboard. Start a course by clicking on the purple START button on the bottom right of the course description. Your dashboard changes when you start a course. You will see a list of course modules on the left hand side of your dashboard. You will complete all of the modules during the course. The first module will already be selected for you. Click on the purple START button in the middle of the dashboard to start the first module.